You are currently browsing the The Pet Product Guru blog archives for the day Monday, August 13th, 2018. Veterinary Technician, Virginia Rudde of the Minnesota School of business says that when it comes to protecting a pet in an emergency, you must plan ahead. She says that you have to make sure that the whole family is in on the plan and that all members know what their part is. This will make things go much smoother in an emergency. The means keeping a collar and dog leash, food and water and your pets medical records on hand in case you need to evacuate. Rudde also recommends microchips or another type of permanent identification that won’t be affected if your pet is lost or is injured. During a disaster, emergency personnel such as a policeman or fireman may ask your neighbors if there is a pet inside your home. It’s a good idea to give emergency personnel a list of contacts who will be able to answer questions about your pet in your absence. 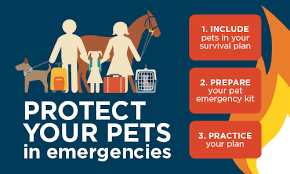 Plan ahead and make sure you have a plan to protect your pet in the event of an emergency. Happy Monday! Make sure you include the greatest oldies of all time on Edgewater Gold Radio. Turn us on at work or download the free Edgewater Gold Radio app. Listen from our website: Edgewatergoldradio.com.